Thanks to Let’s Encrypt web servers can request trusted and signed certificate for free in a fully automated manner. A web traffic load balancer is basically a proxy server, acting like a web server on the frontend and like a HTTP client towards the backend. So why not let the load balancer’s fronted (the web server part) take care of fetching a certificate from Let’s Encrypt? We have seen other web servers, such as Caddy, taking care of certificate management. Unfortunately, this is not a feature that is available on Google Cloud Platform (GCP). Furthermore, I can imagine this working fine with a single load balancer, but failing at scale in a multi-balancer setup. The reason is, that Let’s Encrypt has an API limit. One can request only so many certificates in a week. 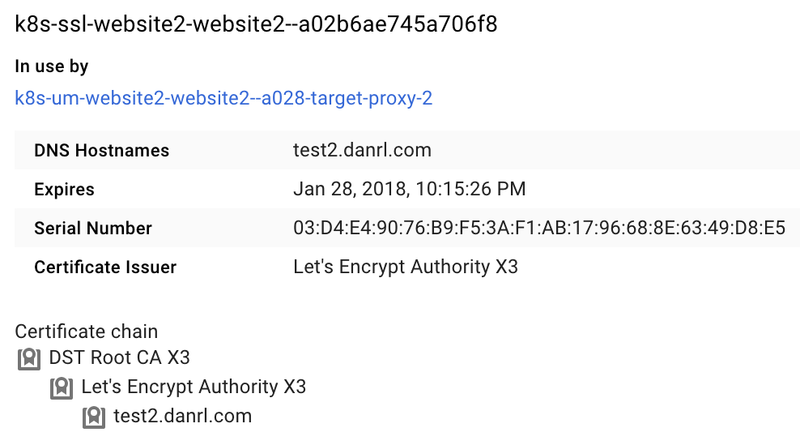 But even if we had access to an unlimited API, it would still be a non-trivial task to make sure the right load balancer is responding to the HTTP challenge request from Let’s Encrypt. Note: If your kubernetes cluster has Role Based Access Control (RBAC) enabled then apply a profile to kube-lego that grants the required privileges before you proceed! value: mail@example.com  # change this! Tip: Consider using a configmap as alternative to hard-coding configuration parameters into a deployment. With kube-lego there are two different ways of defining a load balancer. 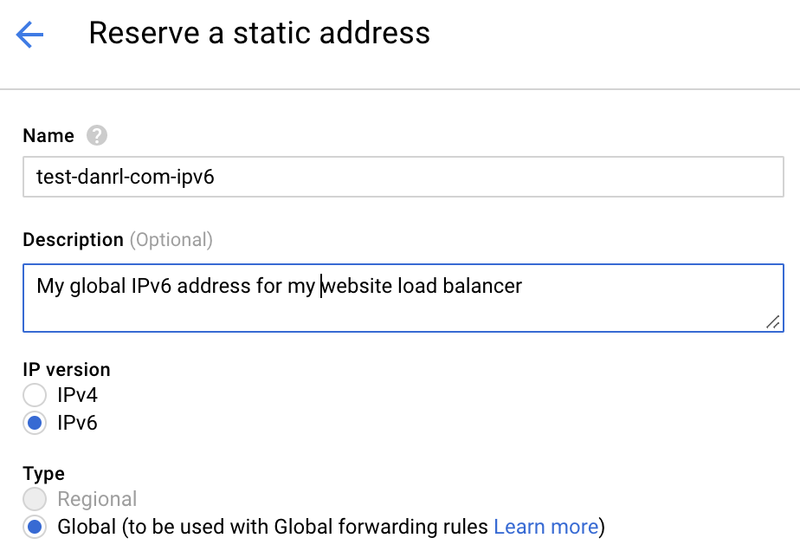 The easier (but more expensive) one is to use a load balancer provided by GCP. 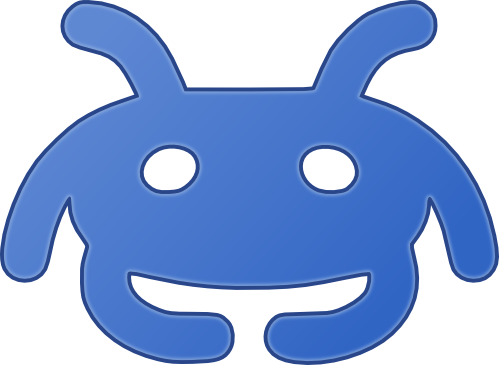 The alternative is deploying an nginx ingress pod and using that as the load balancer. I got good results from both in my experiments. For the sake of brevity, we will use the quicker GCP way in this article. First, we need to create a kubernetes ingress object to balance and proxy incoming web traffic. The important part here is, that we can influence the behavior of the ingress object by providing annotations. kubernetes.io/ingress.class: "gce" This annotation let’s kubernetes know that we want to use a GCP load balancer for ingress traffic. Obviously, this annotation does not make sense on kubernetes installations which do not run on GCP. kubernetes.io/tls-acme: "true"` This annotation allows kube-lego to manage the domains and certificates referenced in this ingress object for us. If we leave out this annotation, kube-lego will refrain from touching it or its associated kubernetes secrets. 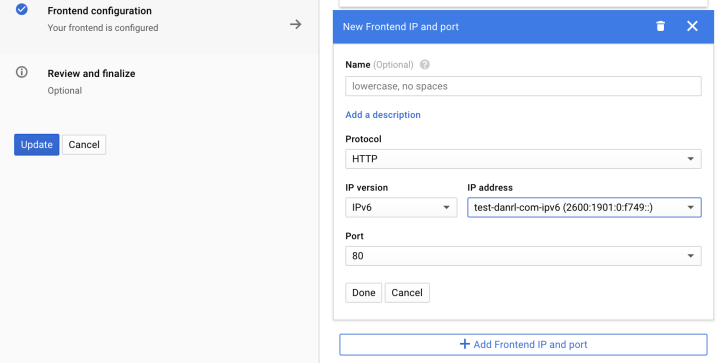 In the standard configuration GCP load balancers are started without an IPv6 address assigned. Technically, they can handle IPv6 traffic and we are free to assign IPv6 addresses to a GCP load balancer. To do this, we first have to reserve a static IPv6 address. This is done at VPC network → External IP addresses. Reserving an address means, that this address can not be used by anyone else on the platform. If we reverse addresses but don’t use them charges will apply. Once the address is reserved, we can assign it to the load balancer. To do that, we have to add an additional frontend for every address and every protocol (HTTP, HTTPS). That is, two frontends for each additional address. We have to do the same for HTTPS, too, of course. When setting the IPv6 HTTPS frontend, we select the current certificate from the dropdown menu. And now I have some bad news for you. ☹️ IPv6 load balancer frontends, certificate renewal via kube-lego, and GCP load balancers do not go very well together (as of time of writing). When kube-lego renews the certificates it ignores manually added frontends. This means, the certificate for the IPv6 address will not be replaced automatically. Very frustrating! 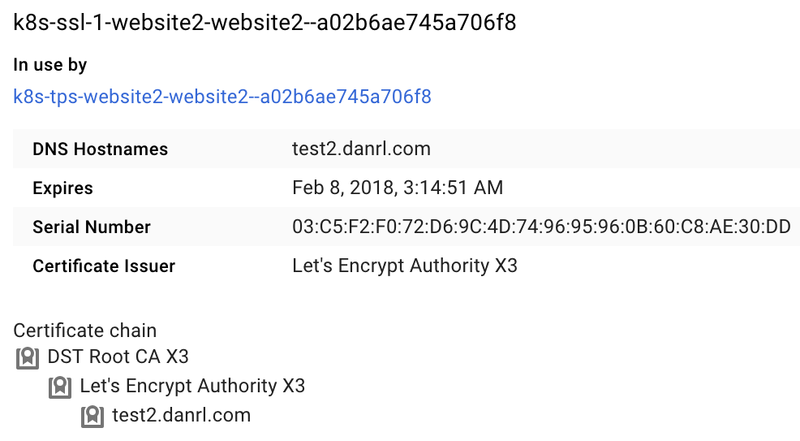 In the screenshot we can see the new certificate k8s-ssl-1-website2-website2–a02b6ae745a706f8 alongside the old one k8s-ssl-website2-website2–a02b6ae745a706f8. Only for the IPv4 frontend was the certificate replaced.